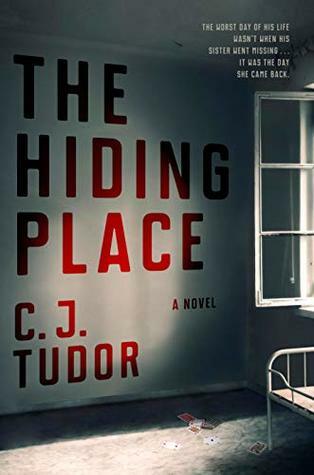 Having read C. J. Tudor’s first book, The Chalk Man, and really enjoying it I was quite looking forward to reading The Hiding Place. After finishing this one though this thriller just didn’t seem as thrilling to me as the first book. Joe Thorne never wanted to return to his hometown of Arnhill after everything that had happened to him and his family growing up. Joe’s sister Annie had disappeared when Joe was a teen but she did come back but things were never the same. After getting an email that things are happening in Arnhill again Joe decides he needs the answers to what happened all those years ago and are happening again now. I do believe when I wrote up my review for The Chalk Man I had mentioned how it reminded me a lot of Stephen King. The story seemed to take on it’s own life but the style had that distinct flavor to it. Well, now with this second book I really failed to find the originality with this one. This to me was really a turn off when I kept comparing the book the entire read instead of just getting that feeling to the style. What I’d rather see from this author is to tackle something completely original that will wow me next time as this one was just one of those meh reads to me after too much comparing. Oh I heard this… It was too much like Stephen King hence most have not liked it..
She’s definitely a good writer but the whole idea behind this was what the problem people are having with it, it’s like re-writing someone else’s book. Thanks Sandy! Sorry they left you hanging on this one, that’s always so frustrating that I think I’d almost rather just get the no. I struggled with this one for the same reasons! Great review, Carrie! Thanks! I do hope she comes up with a more original plot for her next book because she’s definitely got the talent to write. Great review, Carrie! I wanted to love this one so much but couldn’t because I thought it was too much like she was retelling Stephen King’s books. I’d completely agree with you that I’d love for her to write something original-I saw on Twitter the other day that she’d just finished her 3rd book and my 1st thought was please, let it not be another SK fan-fiction! Thanks Stephanie! I will still give her next one a try but this one just made me think you have talent please use it on your own ideas… nothing wrong with having that same style of writing but this one just came too close plot wise to me. I want to read her next one too since she’s just so talented like you said, but that was the thing–it was just too much like another author’s book. I guess if you want to write horror like anyone, then SK is the best, but still have you’re own plot. Book 3 will be interesting to read! I’m in total agreement, lol!